A water main break Friday evening in Wayne Township caused a 3,200 gallon fuel oil tank to fall into a sinkhole and car accident. INDIANAPOLIS — A water main break Friday evening in Wayne Township caused a 3,200 gallon fuel oil tank to fall into a sinkhole and car accident. 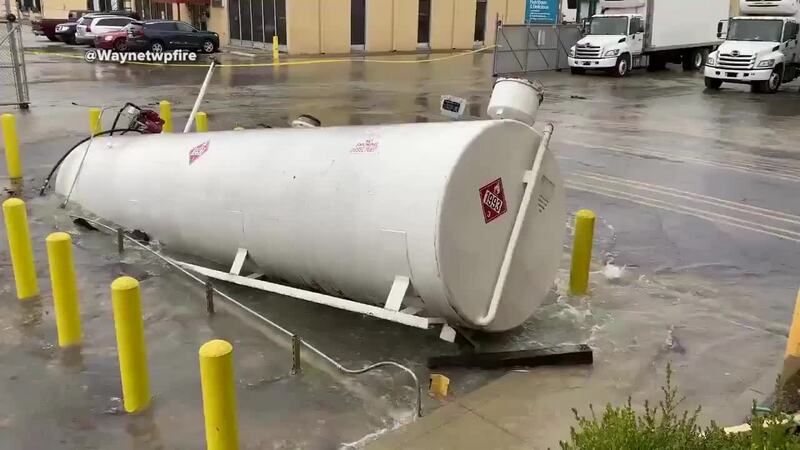 Wayne Township Fire Department firefighters and emergency personnel were called around 6 p.m. to First Choice Seafood, near West Minnesota Street and Stout Field East Drive, on a possible fuel leak, WTFD Captain Michael Pruitt said in a press release. When they arrived, they located a 12 inch water main break. While crews were on scene, an irate person started an altercation with a business employee, Pruitt said. Later in the evening when a flatbed semi-truck delivered a crane to the scene, an Uber driver hit the loading ramps to the trailer, went airborne, and struck large toolboxes on the semi-truck, Pruitt said. Then, not realizing he was on the trailer, the Uber driver then stepped out of his vehicle and fell to the ground. He was taken to the hospital in stable condition. Crews were eventually able to life the tank and no fuel was released, Pruitt said.